This weekend Pride is the main event! There is too much on to list all events here, but the Antwerp Pride page has all the deets. They also have a Facebook page too. 2017 is a special year: Antwerp Pride turns ten! Already underway, and coinciding with Pride, is the Antwerp Queer Arts Festival – their Facebook Page is also very helpful in keeping you up-to-date with their many events. Here’s the GOOGLE MAP for this weekend. It’s Pride parade day! The Parade starts at 2pm and follows a route from the south, then along the river, thusly: Vlaamse Kaai (start) – Verschansingsstraat – Leopold De Waelplaats – Karel Rogierstraat – Marnixplaats – Scheldestraat – Scheldekaaien – Sint-Pietersvliet (end). The end of the route is right near Steenplein which is where the Pride Party will be happening from 4pm. This is free -there will be 2 stages with DJs, drinks and food. This is usually a busy, noisy and fun party. Bos Uitstap is a day festival at Noord Kasteel Oost which only costs a fiver for a ticket (10 if you want the BBQ too). For something a bit different, how about this Open Air Chess Tournament on Groenplaats (near the Rubens Statue) from 10am -18.30. From 10am there is the regular fleamarket on Sint Jansplein -I like this one. It’s very diverse and Sint Jansplein is a sociable neighbourhood square, with a playground. 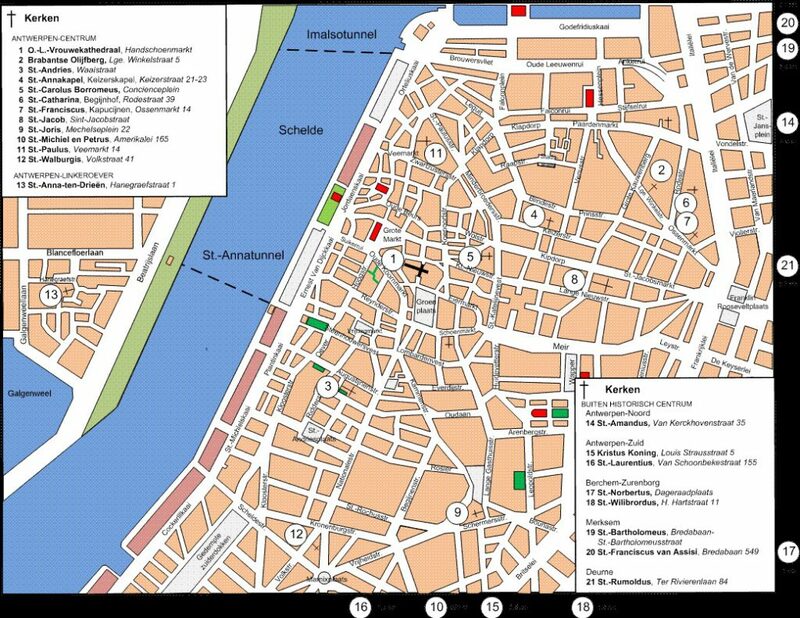 From 7pm until 11pm it is in Antwerp Night of The Churches in Antwerp: 25 churches in the Antwerp area will open their doors for free expos, music, bell ringing and guided tours. Twelve of these are close to the centre of the city and can be seen on this map. Pride’s closing festival will be on Grote Markt from 1.30pm with music and live bands (including Army of Lovers) until 6.30pm. It might be advisable to get to Grote Markt on time if you are keen to attend, as the square will be closed once full. A reminder for anyone with kids aged 6+ who need to be amused -Het Steen runs workshops each Sunday from 1pm. These are free and you can turn up at any time while they are on (bear in mind that this Sunday the area will be particularly busy because of the Pride Party) and while Belgian school holidays are on (i.e. until 1st September) the workshops will also take place on Saturdays. The weather looks as though it will be similar to last weekend -cloudy with some sun and warm (but not hot) temperatures of around 20- 22 degrees. Chances of rain are low. Sportopia is on in Park Spoor Noord (in the Loods building) for kids and teens until the 27th August. Buurtpleintjes is an initiative from Stad Antwerpen offering free sporting activities on local squares around the city, until October. Last year, my son really enjoyed a series of free basketball lessons on Sint Andriesplaats as part of this initiative. Start by checking here to see what’s on offer near you. Next Tuesday (15th) is a public holiday. But why? I hear you cry. Well, it’s a Mother’s Day celebration which is unique to this area. This, from the Wikipedia Mother’s Day page: “…There are also many people who celebrate Mother’s Day on 15 August instead; these are mostly people around Antwerp, who consider that day (Assumption) the classical Mother’s Day and the observance in May an invention for commercial reasons. It was originally established on that day as the result of a campaign by Frans Van Kuyck, a painter and Alderman from Antwerp”. Many cafés and restaurants will be offering Mother’s Day brunches and lunches, if you want to treat your mum, and there is a Rubensmarkt in the old town (round Suikerrui and along the kaaien by the river, near Steenplein) where the stall holders dress up in 17th century costume. … And on Wednesdays at Bibfabriek, there are activities for children.